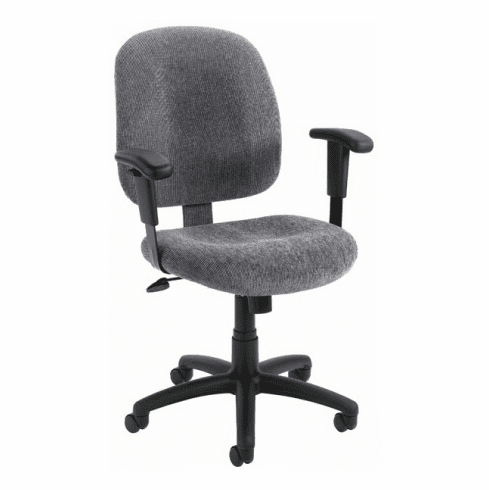 Boss Mid Back Task Chair with Chenille Fabric [B495] Free Shipping! With its smart design, this task chair will relieve pressure on lower backs with its mid-back styling and lumbar support features. Height adjustable, the base is large and provides extra stability. Upholstered in soothing smokey Gray, Black, Chestnut, Sky Blue or Wine Chenille fabric, it is a pleasure to sit down and complete whatever tasks need doing. These mid back task chairs normally ship within 2-3 business days from our GA or CA warehouse.